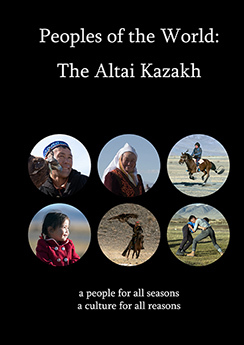 The final feature-length documentary in the Peoples of the World trilogy is The Altai Kazakh (2018). This film is not rated; it contains scenes, such as hunting and animal slaughter, that some viewers may find disturbing. Viewer discretion is advised. "Among the last of the world's truly nomadic people, the Kazakh of western Mongolia not only survive in the harshest climate on Earth, they also tenaciously preserve their culture. This documentary offers a fascinating glimpse inside that culture and their two-hundred year history in Mongolia. Learn how a boy's coming-of-age is marked when he has his hair cut for the first time. 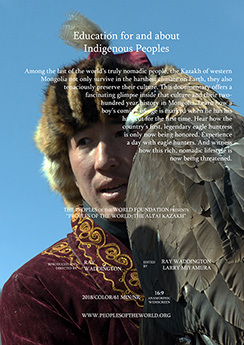 Hear how the country's first, legendary eagle huntress is only now being honored. Experience a day with eagle hunters. And witness how this rich, nomadic lifestyle is now being threatened."